I now live in the library ghetto. 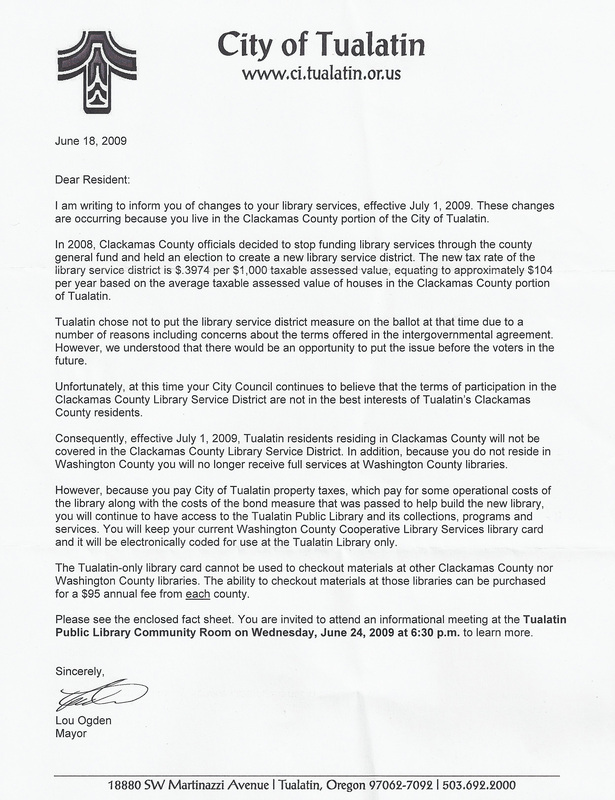 This means that, because of where I live within the City of Tualatin, I can reserve or check out books only from the Tualatin Public Library, and not any of the 13 other libraries that are a part of Washington County Cooperative Library Services. Thankfully, my local newspaper is all over it. Oh wait, they only publish once a week on the same day that the letter came out. Later: I’ve started generating a list of questions I think it would be useful to have answered. Weigh in with your own by using the tip form. Hi there! Thanks for following Tualatin Library on twitter. I hope you’ll be able to attend Wednesday’s meeting about “the ghetto”. If you can’t make it, send me a quick message and I’ll make sure that it’s included as public testimony. You and your neighbors deserve to be heard! American treasure and author Ray Bradbury’s love of public libraries was accounted in the New York Times Saturday. He spoke of being raised by libraries (during the Great Depression, no less). It is too bad out mayor and city council are restricting children in certain parts of Tualatin to such a stunted version of Mr. Bradbury’s upbringing. I also am furious about the library decision to allow me to only use one library in the entire area. We pay very high taxes and I always vote in anything to support the library. I even voted for that new library district…thinking it would be good. Didn’t know it would leave me in limbo as far as using all the branches. Please let me know what if anything people can do to change this. I certainly do not feel it is fair to pay $95 extra a year to each of the two counties!! !